With some imagination, maybe you can see Snoopy's nose, too? 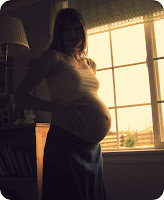 I think I look pretty "ripe," but gestation calls for several more weeks of fattening up. I am OK with that. However, my middle will be stretching in ways I have never seen, I am sure! I am so thankful that measurements are all good so far. At this point, I go in for weekly checks. Today I was about 1 centimeter dilated and 30% effaced. Of course, I could stay like this for several weeks, but the body is definitely "warming up" and we are feeling like we need to be ready at anytime. This boy already makes me laugh. It has been a regular accurance for him, during this entire pregnancy, to move away from the monitors. Just when his heartbeat, for instance, has been detected he "slips away" causing the doctor to go "hunting" again. It's an exciting time: preparing, knowing it won't be long til we meet him face to face! Oh, so sweet!